Defending champion CEZ Basketball Nymburk (NBL) landed 27-year old American forward Calvin Godfrey (206-109kg-90, college: Memphis). It is actually his comeback to Nymburk as he has played here before. Godfrey played most recently at Al Arabi in Qatari D1 league. He managed to play in five leagues in three countries last year (!!!). 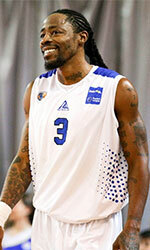 Godfrey also played for Malvin (LUB) in league where in 13 games he averaged 13.5ppg, 4.3rpg and 1.3apg. The other team Godfrey played shortly was CEZ Nymburk. In two NBL games he had 9.5ppg, 2.0rpg, 1.5apg, 3.0spg and 1.5bpg. He also played 1 game in Basketball Champions League where he recorded just 2 points, 4 rebounds and 1 block. Godfrey also spent pre-season at Al Moutahed (LBL) in Lebanese league. Another team he played briefly was Al-Riffa (Premier League) in league. In two games he got impressive 20.0ppg, 13.0rpg, 1.5apg, 1.5spg and 3.5bpg. Godfrey's team made it to the Gulf Coast Championships Semifinals. Among other achievements he received Asia-Basket.com All-ASEAN League 1st Team award in 2016. And here thanks to pro basketball Godfrey experienced life on four different continents. He is familiar with European, Asian, Latin American and of course North American leagues. Godfrey has played previously professionally in Malaysia, Ukraine (Budivelnyk) and Lebanon (Sagesse). He attended University of Memphis until 2015 and it will be his fourth season in pro basketball.